Secrets to standing out amongst the competition - and landing that job! Are you interested in finding a remote job but worried about the quality of your resume? Well, you're in luck - we sat down with Taylor Lane, founder of Remote Like Me, and asked for some tips on crafting the perfect remote job resume. Taylor has helped tons of remote hopefuls turn their virtual career dreams into a reality. With a focus on customizing resumes for remote positions, Taylor teaches people of all ages how to stand out and get more job offers. Would you like access to exclusive informative chats like this in the future? If yes, then click here to become a PowerToFly VIP and join our community of women here to empower one another. What are your tips for landing your first remote job? Taylor Lane: In general, we, as women, have a confidence issue. No matter how confident you are, we have this thing that stops us from saying certain key terms and describing ourselves in certain ways on our resume. My overarching tip is to be genuine, authentic, and confident, because when you're presenting your true self on your resume, you're going to automatically align with companies that will allow you to thrive. How do remote resumes differ in terms of format from a traditional resume? TL: This is a great question because I have what some people may call a radical approach to customizing resumes, which is that you should be getting as creative with your resume as the company projects itself to be. I advise all my clients to use a program like Canva, or a design software you're comfortable with, to make a truly unique resume. I've talked with hiring managers as well as other remote employees, and they can't count the number of plain, black and white resumes the get on a daily basis. If you think you're being too creative, you're not there yet. Remote companies like to see that a person is tech savvy even if your job isn't related to design. A creative resume shows that you know what looks good online. My best advice is to go to the company's website, and match their tone. Are they using cartoon icons, colors, floral prints, or really professional lines in specific colors? That's how you know how far you can go. What are remote companies looking for in a resume? How can I stand out? TL: This is a good one because the phrase "stand out" is always on people's minds. What's going to make you stand out is your ability to see why the company aligns with you. If you can't pull that out, and you can't show it on your resume, it's like trying to connect the dots on a really disheveled picture. When it comes to your resume, you have to connect the dots for them. What does the company value, what experience do they need, and what personality traits do you bring to the table? Does your resume match their needs? If yes, you're going to stand out. If not, where can you pull from your prior experience to try to connect those dots? How important is prior remote experience? 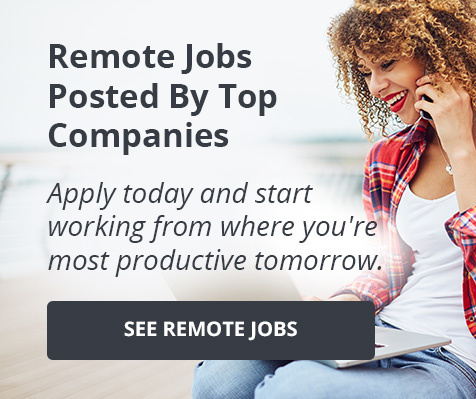 TL: It's fair to say that when companies are looking through a pool of applicants, those with prior remote experience definitely stand out - but for those who have't necessarily had a full-time remote job, there are still ways to highlight remote experiences on your resume. If you've ever worked from home for at least a day in your life—you can put it as the first bullet of one of your job descriptions. Bold the word "remote" in the description. If you've never ever worked from home, you can write in a 'Fun Facts About Me', 'Career Development', or 'Professional Development' section that includes your membership in career development groups like PowerToFly VIP where you meet weekly online and use online communication tools like Slack, Zoom Conferencing, or other online programs you would normally use in a remote job. How do I combine multiple experiences (customer service, project mgt, design) into one resume? What do I do when I don't have enough space?! TL: Let's talk about space - do not cry crocodile tears if your resume has to be two or three pages. You are not going to get a senior level position with a one page resume. If you're at that level, don't hide from your experience. You can have as much space as your career needs. When you go on to two pages, you get to speak more, and you get to fill the space with fun things that humanize the process. For example, you can include one sentence testimonials from bosses and companies you've worked with or your peers. The only thing you need to make sure of is that the top half of the first page of your resume is fully optimized to the opportunity. That means if you've been a customer service manager, project manager, and a designer, and you're going for a project management role, guess which skills need to be at the top of the resume? It's proven that hiring managers look at resumes for six seconds before they consider reading further, or before they pass you on to a "no-go" pile, either physically or virtually. So you can do as many pages as you want, just make sure that relevant experience is on that first page. Once your resume makes it to the "in" pile, is there anything I can do to further my chances of being chosen for an interview? TL: This is something I get the most resistance on. If you've never cold pitched in your life, you're missing out on 50% of the opportunities in the remote world. I want you to research companies based on the values and work styles you want, missions you stand behind, and products you already love to use, and I want you to cold pitch them with your skills. If you've never done that, you're not creating your own opportunities. Guess who is your competition when you cold pitch? Just you! So if you want zero competition, cold pitch. For example, let's say I see that there's a marketing position open, and it doesn't quite fit my experience or what I would like to do with my career; however, I could tell the company that I already have this many ideas on some content creation that I could do for you, and I'm wondering if you have time to talk about how I could impact your company. You can also be your own advocate. People think that networking ends when you land your next role, but guess what? Networking should really be something that never ends. Have you written in Facebook groups, your alumni group, or in some of your social networks? I want you to talk to people. For example, try searching the company in LinkedIn. See if any of their current employees in the department you're going in have mutual contacts with you. Even if they have nothing in common with you, still send an InMail message to them. Find someone that you resonate with and send an InMail message to them. Sure this company may not have the perfect role for you now, but who knows what they'll be hiring for down the line! These 10 new remote jobs are hot off the press!